The Cochran Hose Company in Sewickley, Pa., was organized in 1876. It originally used bells to call volunteer firefighters and alert the public, but switch to a Gamewell Diaphone in 1919. The Cochran Hose Company is in the same building as the Borough of Sewickley municipal office on Thorn Street. The tower seen in the middle houses the department's fire horn, which can be heard blasting for about 16 seconds when there's a fire. The interior of the city of Pittsburgh's Engine 8 in 1969 showing firefighters checking the alarm board for an incoming call. On the far right, Battalion Chief Ed Seger moves number tags to indicate which companies were responding to the call. Pittsburgh's Engine 30 on First Avenue downtown in 1927, shortly after it was purchased by the city. The apparatus now belongs to historian Edward Ross. The air pressure tank used to fill the Cochran Hose Company's fire horn. Before motorized engines, most fire departments used horses to carry firefighters from the station to a blaze. In Pittsburgh, two horses typically carried an apparatus, unless it was a particularly hilly neighborhood, when three would be used. Hoses after being cleaned and wrapped in the back of the Cochran Hose Company. Everyone’s heard the siren of a fire truck as it zooms down the street. But the sounds associated with fire alerts have changed over time. All around the Pittsburgh region, fire stations alert volunteers and the public in distinct ways. While working in Sewickley, Pa., Good Question! listener Luke Tippman heard a peculiar noise coming from the Cochran Hose Company. "This thing, this buzzer, that sounds very different [from other fire alerts],” Tippman said. Fire Chief Jan Von Hofen knows what Tippman heard. He’s been listening to the station’s fire horn for the past 51 years. It all started, he said, when the volunteer department was founded in 1876. The company was started for the same reason as most other stations. “There were things burning down and the community felt the need for a fire department,” Von Hofen said. This is part of our Good Question! series where we investigate what you've always wondered about Pittsburgh, its people and its culture. Sewickley’s station operated much like others in western Pennsylvania in the 19th century. Firefighters used hand-drawn hose carts and fetched water from wells and cisterns. Eventually, horses carried volunteers to a blaze. Now, the company has several Pierce Engine firetrucks that can pump about 1,000 gallons per minute. Before cell phones and pagers, Von Hofen said fire officers would be alerted to a blaze via electric bells that’d been installed in their homes. They’d rush to the station and ring a large bell to alert the volunteers. But over time, the bells broke and in 1919, the Sewickley station decided to purchase a sturdy Gamewell Diaphone. The air-powered metal horn was a popular model for fire stations. Many can be heard from as far as 6 miles away. Originally Sewickley's was programmed to blow different cadences based on the location of the fire. It’s not like that anymore, Von Hofen said, usually the horn blasts for about 16 seconds. The view from the main floor of the Cochran Hose Company in Sewickley, Pa., looking up toward the station's fire horn. The ropes going directly up the staircase are the manual trigger for the fire horn. Typically, it's operated digitally. Other stations still have horns, but many don’t use them because residents complained about the noise. Von Hofen said he’s heard similar criticisms in Sewickley. City of Pittsburgh fire stations don’t use a horn or a siren. Historian Edward Ross said that’s because in 1870 when the department was established, city firefighters were paid. There was always someone on staff, no there was need to call volunteers in. The only exception, Ross said, was during WWII, when some stations were equipped with sirens to conduct air raid warnings. Around 1880, the city installed Gamewell fire alarm boxes in neighborhoods. Ross said these metal devices were typically red or yellow and fixed to poles on street corners. A local policeman, business owner or resident would have a key that they’d use to open the box and pull down a hook in the case of a fire. A Gamewell fire box that was once at the corner of Fallowfield and Crosby avenues in Beechview. That hook, he said, would trigger an electrical signal that corresponded with the box’s number. A telegraph-like system would transfer the location to the fire dispatch center. “If you pulled fire box 124, bells would ring out one...then two...then four,” Ross said. Most firefighters knew their station’s numbers by heart. Ross said before motorized engines were introduced, even the horses recognized the bell patterns. But if they missed the bells, a ticker-tape machine would punch the corresponding number of holes in a piece of paper. On each station wall, Ross said, there was a board with all the numbers and locations in the city. “They also had a list of index cards in the station that had down what fire apparatus was supposed to respond on that call to the first alarm of fire,” he said. 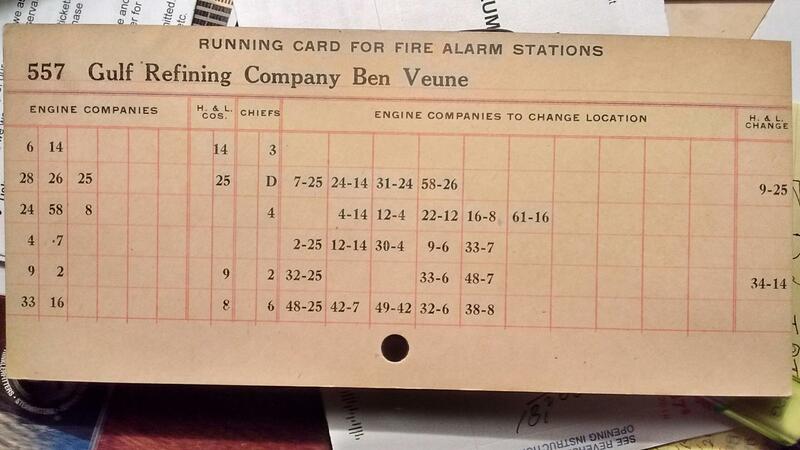 One of the more than 2,000 running cards Pittsburgh used, showing which units responded on the 1st alarm to the 6th alarm for a blaze along the railroad tracks between Oakland and Bloomfield in 1920. Eventually, vandalism and technological changes like pagers and cell phones made the boxes less useful and the city took them down in the 1980s. All calls are now phoned into the 911 call center. But at the Cochran Hose Company, Von Hofen said the fire horn has become a way for volunteers to easily recognize their station’s call. Giddy crowds of kids from a local summer camp recently gathered in the lobby of the Duquesne Incline’s upper station on Mount Washington. The exhibits at the Carnegie Museum of Natural History represent only a small portion of the museum's collection. The Carnegie Museum of Natural History is expansive — a person could spend hours walking the different exhibitions. But what's on display is only a small portion of what's in the museum's possession. Pittsburgh was one of the first cities in the U.S. to experiment with the concept of a dedicated bus rapid transit system. Today, Pittsburgh’s three busways cover nearly 20 miles and help remove thousands of cars from the city’s congested highways.